Experts cautiously raised the possibility Thursday that South Korea, North Korea and the US could declare an end to the Korean War in Singapore following a Pyongyang-Washington summit later this month, amid preparations in full swing for the historic summit. If the summit -- which US President Donald Trump earlier canceled only to say a day later that it could still take place -- is held as planned in Singapore, the possibility of a three-way summit involving the Koreas and the US there would be heightened, experts said. 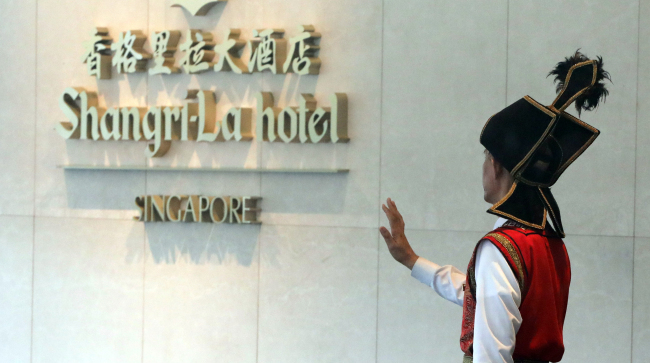 North Korea and the US are working to salvage their high-stakes summit originally scheduled for June 12 in Singapore. 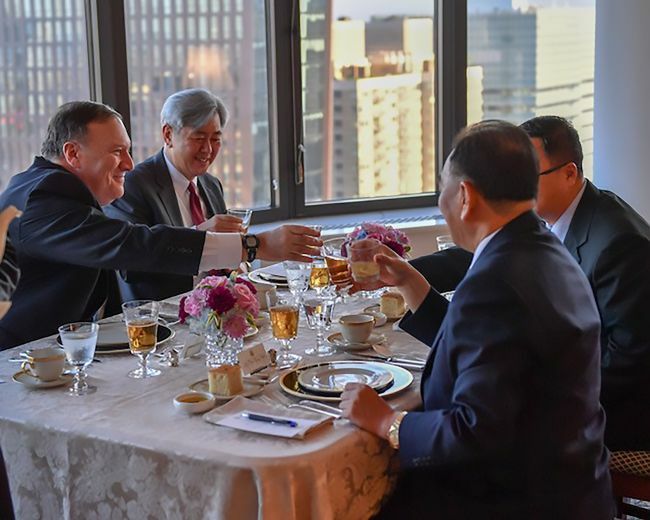 North Korean senior official Kim Yong-chol arrived in New York on Wednesday to meet US Secretary of State Mike Pompeo, fueling speculation that the countries’ preparations for the summit are in the final stages. Separately, preparatory meetings between the US and North Korea were held at the North Korean side of the border village of Panmunjeom to discuss agenda items for the summit, while a separate team of US officials met North Koreans to coordinate logistics in Singapore. Declaring an end to the Korean War is thought to be a precursor to ending hostilities and establishing a peace regime on the Korean Peninsula -- key to guaranteeing the North Korean regime’s survival. South Korean President Moon Jae-in has expressed hope for holding three-way talks to declare a formal end to the 1950-53 Korean War, which ended in an armistice, possibly in Singapore following the North Korea-US summit. “I have expectation that the declaration of an end to the Korean War could proceed through a three-way summit among South Korea, North Korea and the US in case the North Korea-US summit is successful,” Moon told reporters Sunday, following his second summit with North Korean leader Kim Jong-un a day earlier. In the Panmunjeom Declaration signed on April 27, Moon and Kim agreed to push for complete denuclearization of the Korean Peninsula and replace an armistice, which left the two Koreas technically at war, with a peace treaty. To do so, they said they would seek to hold three-way talks among the two Koreas and the US, or four-way talks involving China. The US and China are both signatories to the armistice. Trump said earlier the Koreas have his “blessing” to discuss the end of the Korean War, if North Korea agrees to give up its nuclear arsenal. But the presidential office remains cautious, saying that holding a three-way summit and declaring an end to the Korean War all depends on the outcome of the North Korea-US summit. Cheong Wa Dae confirmed Wednesday it had sent an official to Singapore to prepare for Moon’s official visit to the city state in July, but it triggered speculation that Seoul may be preparing for a three-way summit between the two Koreas and the US. North Korea and the US seem to have reached a broad agreement that North Korea take steps to abandon its nuclear weapons program in a short, compressed period of time in return for the US taking measures to guarantee the Kim Jong-un regime’s survival. “If Kim Yong-chol and Pompeo confirm the date for the North Korea-US summit, it would mean many things have been adjusted and the summit is likely to be a success. Then, it would be possible and also efficient to hold the trilateral summit among the Koreas and the US to declare an end to the war,” said Hong Min, a senior researcher at the Korea Institute for National Unification. Cho Sung-ryul, a senior researcher at the Institute for National Security Strategy, also said that it could be possibly done in Singapore a day after the historic summit. “It is one of the measures the US could take to guarantee the North Korean regime’s security until North Korea completes denuclearization and the US ultimately signs a peace treaty with the North,” he said. But China could pose a challenge, he added. “If so, it could complicate Seoul’s plan to declare an end to the war right after the US-North Korea summit,” he said. China on Thursday signaled its intention to actively engage in the process of ending the war. “China is a major party concerned with the Korean Peninsula issues, and will continue to play a suitable role as a signatory to the Armistice Agreement,” Chinese Foreign Ministry Spokeswoman Hua Chunying said in response to a question from Yonhap News Agency. The presidential office has said that China could be left out of the process of declaring an end to the Korean War, but added its role was essential in signing a peace treaty with the North. China appears to be struggling to retain influence over issues concerning the Korean Peninsula -- key leverage over the US. Other analysts were more cautious about the possibility of the three-way summit, raising questions over whether the US would agree to it.